Commercial window cleaning Tulsa is one of the many services we offer here at gleaming glass. Feel free to give us a call at 918-850-9798. One of the favorite Services we offer here at gleaming glass is commercial window cleaning Tulsa. Commercial window cleaning is our bread and butter. It’s what keeps us in business throughout the winter months when residential window cleaning has come to a stand still. In the winter months, running a window cleaning business can be hard. As a matter of fact, it’s not uncommon to receive no calls at all for residential window cleaning. Consequently, we wouldn’t have any income during the winter if we didn’t offer commercial window cleaning services. Arguably, cleaning windows for commercial accounts is necessary for just about every window cleaning business. No doubt, there are probably window cleaners out there who don’t have to clean commercial windows. There is a big difference between cleaning commercial windows and residential windows. As a matter of fact, the going rate for a commercial window is almost a tenth of what we charge for residential windows. With commercial cleaning the window cleaner has to move very fast in order to make a profit. They are forced to clean hundreds of Windows a day to make a living. Whereas companies that are strictly residential window cleaning don’t have to move as fast to make a profit. All things considered, residential window cleaning is much more rewarding. Especially if you live in a state like Florida or California where winter months are virtually non-existent. At any rate, commercial window cleaning is necessary for most of the window cleaners in the United States. Presumably cleaning commercial Windows is extremely important for window cleaners who live in the Northern Hemisphere. All things considered, for some reason the competition is more fierce in commercial window cleaning. You would think the competition would be tougher with residential window cleaning. But it’s not. As a result, every window cleaning company is trying to charge less than the next. Consequently, the average window cleaning price her window has dropped significantly. In the meantime, the cost of living continues to rise. It’s just not a winning solution or equation. It’s easy to understand though why the prices are so low. With commercial window cleaning your customers basically consists of business owners and managers for businesses. Everybody is trying to run their business with minimum operating costs and expenses. Window cleaning is kind of look down on in our society. Moreover, it’s not viewed as a highly skilled labor. Therefore not as much value is placed on the window cleaning service. 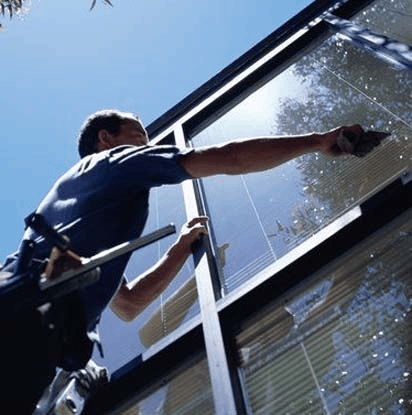 In order to get commercial window cleaning accounts, the best thing to do is go door-to-door. Make sure you have some nice business cards made up. Furthermore, make sure your uniform is clean and your facial hair is well-groomed. Finally, all you have to do is go from business to business. Simply walk into a business and ask for whoever is in charge. In most cases this will be the business owner or manager. When you have their attention it’s time to sell them on your services. At this point, ask them if they currently are using any window cleaning company. If they say they are not using company, give them your business card along with a window cleaning estimate. On the other hand, if they reply with yes we have a window cleaner give them your card anyway. Here at gleaming glass, we look for customers who are looking for a premium service. We are not going to compete with all the commercial window cleaning tulsa companies out there. Everyone is competing in a race to the bottom and it’s a suicide mission. We prefer to go after customers who value a premium service. We want the customers who appreciate window cleaners with good character, neatly groomed appearances, and a good work ethic. Our ideal and likely buyers appreciate the fact that we clean up the soapy water left behind after squeegee a window. You wouldn’t believe how many companies I come across who just leave their soapy water on the floor and window sills. Not long ago, I walked into a Jamba Juice. A local Tulsa window cleaning company was cleaning their windows. After they left, it was apparent that they left behind water on the floor. The best part about commercial window cleaning is the reliable income. We don’t have as many commercial accounts as we used to in the beginning of our business. More and more, we are transferring to residential window cleaning services. Incidentally, our income tends to dry up in the winter months. As a matter of fact, we are currently brainstorming on Services we could offer during winter to complement our income. We’ve been considering gutter cleaning but that too is a cut throat industry. Many of the lawn services out there also offer gutter cleaning. However, these lawn services are notprofessional. By in large, most of them like to just blow the debris out of the gutter and on to your lawn. At this point, they will charge you for a centrally relocating the debris that was in your gutters, and moving it on your lawn. The commercial window cleaning tulsa process is a little different than residential cleaning. The main difference is the window sills. Window seals on Commercial Windows tend to stick out a lot more than residential. As a result, the soapy water is trapped on the window sill. The water has nowhere to go so it just sits in a puddle. The window frames and Sills on Commercial windows are typically black in color. Incidentally, soapy water that dries on the windowsill looks bad. Arguably, it’s best squeegee off the water from the windowsill after you have finished cleaning the window. First make sure all the glass is clean. Afterwards, simply squeegee off the soapy water from the windowsill. You need to sweetie the horizontal surface which is the top of the window sill. Afterwards, squeegee off the vertical window sill. Otherwise, they’re commercial customer might switch to another window cleaning company. Construction clean up on commercial window cleaning tulsa projects are tough. In my opinion, construction clean up is more common on Commercial properties rather than residential. In any case, construction cleanup can be a difficult task. First and foremost, there is typically a lot of debris on the glass. By and large this debris consists of concrete, brick mortar, and paint overspray. The most effective way to remove these debris are by using a scraper. This is where things get tricky though. Anytime a window cleaner uses a scraper they run the risk of scratching the glass. I can’t tell you how many times I’ve come across scratched glass from scrapers. Whenever you throw Concrete and brick mortar into the mix, your chances increased dramatically. If a piece of concrete gets trapped under the scraper blade you will almost certainly scratch the glass. Nothing is worse than scratched glass. If you are a business owner and you are wanting to boost the curb appeal of your business, try window cleaning. Commercial window cleaning tulsa is a great way to boost a business’s curb appeal. Curb appeal is typically talked about with residential homes. However, curb appeal can also describe a business. If you own a storefront business, your windows are literally the face of your business. It’s the first thing your customer see before they walk into your store. If you have dirty Windows they are going to think you don’t care. However, if you have clean windows they are more likely to walk into your business. Your windows say a lot about what you care about. If you don’t care about your business is appearance your customers will wonder what else you don’t care about. Maybe they’ll think you don’t care about your product or service quality.